Kaleidascopia books, to me, are the embodiment of the abstract coloring book. 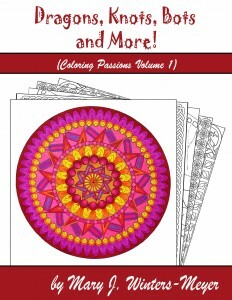 The patterns found in these coloring books invite exploration with every color in your box of pencils or markers, or exploring the possibilities of using all shades of one color, or any other color combination. 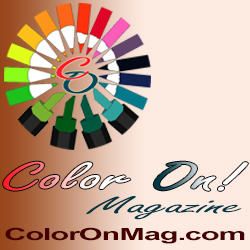 While truly abstract designs give you a ton of options when coloring, they tend to be difficult to review. You can’t really compare them to any particular theme or object! That said, in volume 2 of Loni Gansmann’s Tangled Angles, you’ll find lots of spirals and what I think of as “sunbursts” – lines radiating out from a central circular space, as well as lines forming the “tangled angles” of the title. 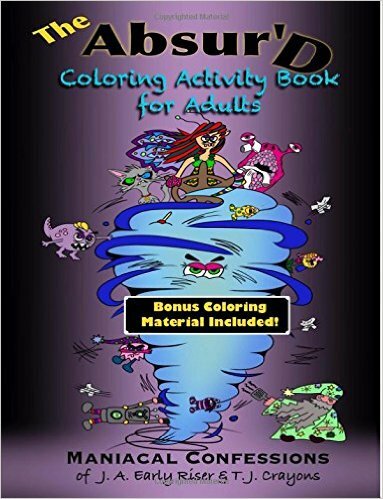 As with all Kaleidascopia books, the designs fill the page completely, and are densely packed, making the coloring challenging. The last couple pages of the book have information on the color wheel, and definitions of various artistic terms. Surprisingly, this creates a new design that has a completely different look and feel to it. Personally, I prefer the clones when coloring. I’ve never been overly fond of designs with thicker lines. But many people enjoy coloring in that style. If you enjoy coloring abstract shapes, which allow you to relax and enjoy the process without worrying about whether your colors match realiy, you will enjoy the books in the Tangled Angles series. Do you have this book? What do you think of it? Let us know in the comments! Don't miss any posts! Sign up for our mailing list!